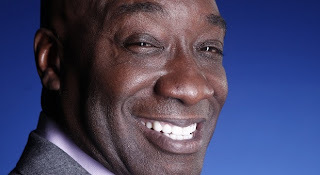 Judy Duncan, sister of Micheal Clarke Duncan, shared how she broke the news of her brother’s death to their 92 year old mother and shared childhood memories of him being quite small as a youngster on the Tom Joyner Morning Show. Ms. Duncan spoke to Skip Murphy (hosting for the vacationing Tom Joyner), J. Anthony Brown, and Sybil Wilkes. DALLAS TX-- Judy Duncan joined the Tom Joyner Morning Show this morning and reminisced about the life of her "little" brother, Michael Clarke Duncan. First Judy wanted to thank everyone for all their support, saying, "we truly appreciate all the love and outpouring of flowers, cards, and candles…we appreciate them and send the love back." Michael was known for his large, buff build but Judy said surprisingly the "Green Mile" star was not always so big. She told Tom Joyner about the duo growing up on the Southside of Chicago, and being forced by their mother to make sure her scrawny brother Michael was picked for the kick baseball team. However, Judy joked how she loved to win and Michael "was not athletic when he was younger...he was quite small" and he could not catch which often left her with a weak player on her team. Judy expressed how full his life had been and shared more stories about Michael; including, one time as a bodyguard having to put a disobedient customer in a wrestling move. She beamed positivity about her brother's life but her voice began to quiver a bit when talking about breaking the news to their 92-year-old mother of her son's death. However, their mother showed pure strength responding to the sad news saying,"we all are going to go that route one day..so what we have to do is thank god for the time we had with him, that's what we do now...and remember we'll see him again." You'll find the full interview here and listen to more stories about the life of Michael Clarke Duncan.